Weight: 9 st. 4 lb. Not much of a team player. Discovered rock climbing while at Gordonstoun and used to set off into the hills alone during netball practice. Also took up shooting as an extra-curricular activity but was instantly banned for showing "too keen an interest'. However, the strength that climbing gave her fingers was to become useful when she started pulling triggers for real. The daughter of Lord Henshingly Croft, Lara was brought up in the secure world of aristocracy - surrounded by tennis, butlers and corgis. But this all started to change when she went to the renowned school of Gordonstoun and found the mountains of Scotland. Later, at her Swiss finishing school, she took to the art of extreme skiing and spent a holiday in the Himalayas searching for more challenging terrain. On her return trip however, the plane crashed deep within the mountains and Lara was the only survivor. Two weeks later, when she walked into a mountain village, her experiences had had a profound effect on her. Unable to stand the suffocating atmosphere of upper-class British society any longer, she realised she was only truly alive when she was travelling alone. Despite this drastic life change, Lara still retains the essence of her upbringing - most notably with her polite, upper-class accent. Lara's parents though, having sported hopes of her marrying the Earl of Farringdon, were less than convinced about this chosen lifestyle and ceased to associate with their daughter - even terminating her monthly allowance. The Earl is still waiting. While in England, Lara lives in a mansion in Surrey which she inherited many years ago. At one time she saw little use in it but now realises that, if nothing else, it is at least handy for storing all the artifacts she has acquired on her travels. She has also had a custom-built assault course constructed in the grounds for training purposes. Lara doesn't consider tomb raiding as a job, merely a way of life - although she has been known to uncover archeological artifacts on commission. To fund her radical lifestyle, Lara writes travel books. Titles so far have included 'A Tyrannosaurus is jawing at my head' and 'Slaying Bigfoot'. Her common complaint though is that she doesn't have enough time to put pen to paper. As well as uncovering many notorious archeological sites - including the Atlantean pyramid and the last resting place of the dagger of Xian, Lara has found fame in other areas - she has driven the dangerous Alaskan Highway from Tierra del Fuego in South America in record time (although this was later denounced by the Guinness Book of Records due to her "reckless driving") and she hit the headlines again when she hunted out and killed Bigfoot in North America. Lara was brought up to appreciate classical music but having been a guest on U2's Popmart tour, has since become a fan of their music. She has also been introduced to the sounds of Nine inch Nails by her Aunty and considers it "good easy listening". Finds trance music, in general, good for training. Despite being a proficient cook from her days at finishing school and having sampled most of the exotic delicacies of the world, Lara usually opts for beans on toast when at home. Any challenging sports. Has a particular interest in experimenting with different, often extreme forms of transport. Has also once admitted to stitching a kind of Bayeaux tapestry of her own adventures while at home. 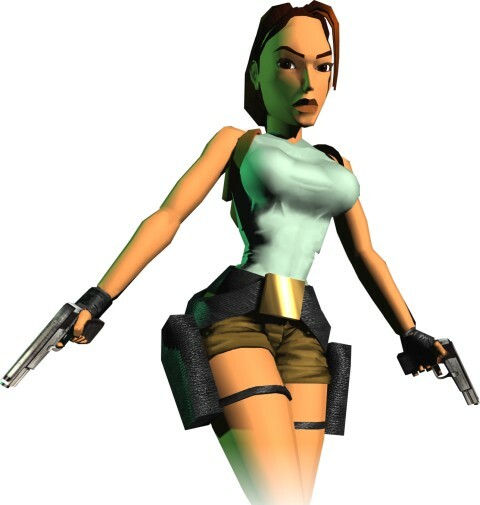 With her unique physical abilities, Lara is certain of being able to break many world athletic records and so sees no challenge in this herself. Her main ambitions still lie in the undefined world of tombs and the past. She has also however, developed a personal regard for Brian Blessed's attempts to climb Everest. If he never succeeds, she is determined to piggy-back him up there. All the great ancient figures who respected themselves enough to design such intricate tombs to be buried in. "Nobody goes to trouble like that anymore..."
Her Aunty's Corgi which has bitten her on several occasions - about which, for once, there is little she can do.